THE PICKIEST EATER IN THE WORLD: DIPLAHAN LECHON: ZAMBOANGAS FINEST LECHON NOW IN MANILA! 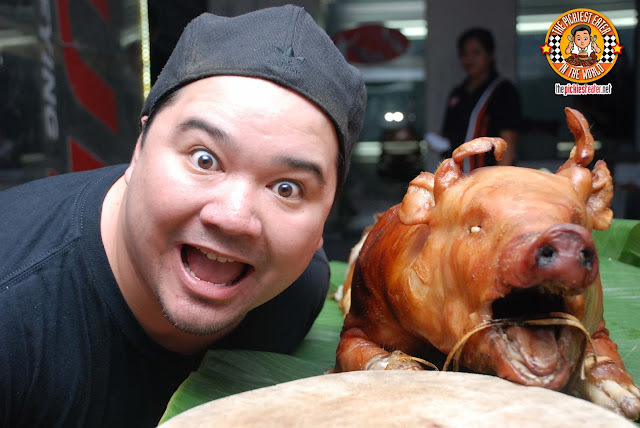 Anyone that has tried Zubuchon knows how bland the Lechon you get in Manila can be. Which is why I enjoyed Manila-Based Pepita's Lechon so much.. because it attempted to added a variety of flavors to their suckling pig through its rice stuffings that compliment the natural flavor of the pork. 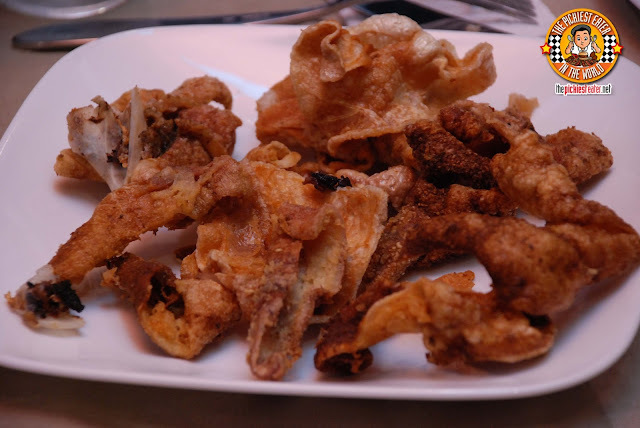 The Diplahan style Lechon, was very similar to the Cebu Style Lechon that I grew up with (and is partially responsible for the present state of my physique), which is why I couldn't wait to sink my teeth into those bad boys waiting for me. 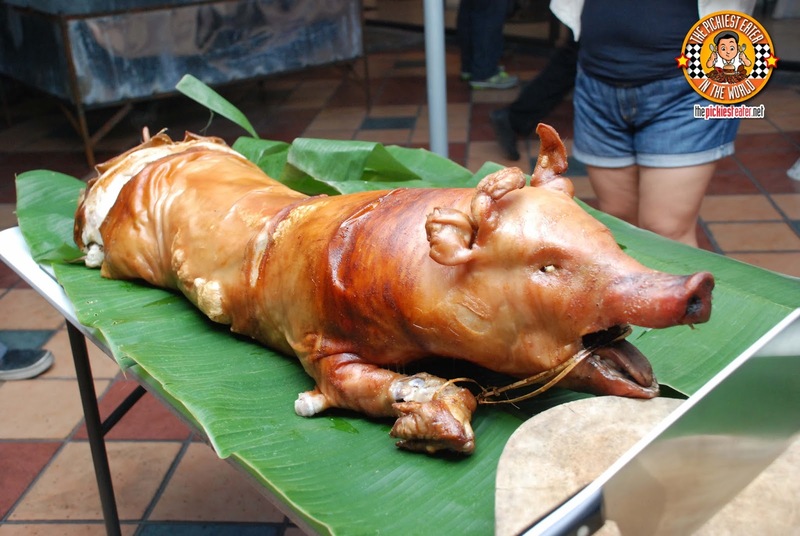 Even from golden hue that the skin gave off, it was evident that you were looking at a perfectly roasted pig. 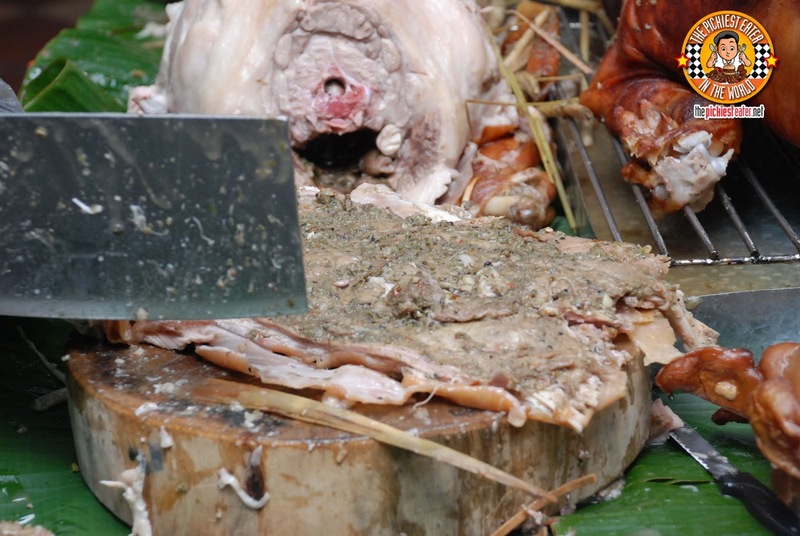 The skin crackled whilst still hanging on to the bits of meat and fat of the body of the pig. 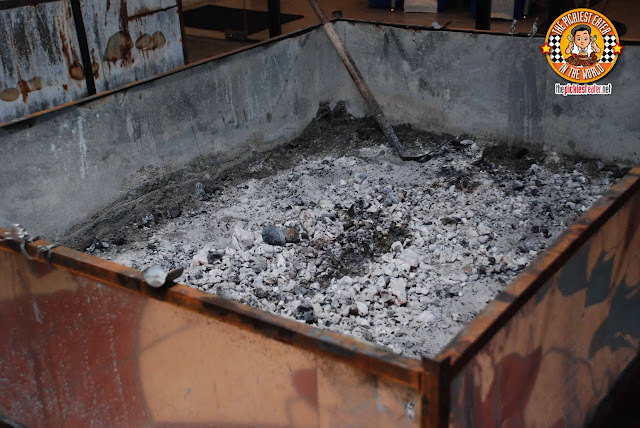 Unfortunately, the pig was done roasting by the time we arrived, but from the smokey smell emanating from the charcoal pit assured us that something magical happened here. Once we settled in, our gracious hosts let the chopping of the pig commence. With every thud the butchers' knife made on the chopping board, small sprinkling of juices would go airborne. Once the meat was exposed, it was clear how the meat was smeared in an herb based rub, unleashing the natural flavors of the pig. 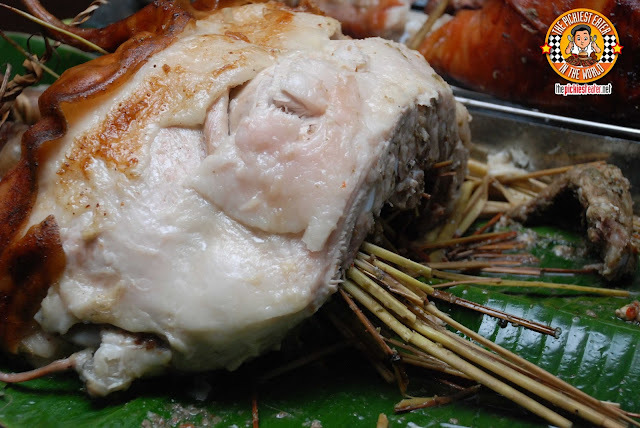 Stalks of Lemongrass and stuffed into the lechon, giving the meat a fragrance from within, allowing the herb flavor to seep from the inside and make its way out, guaranteeing it covers more area than just rubbing the exterior. 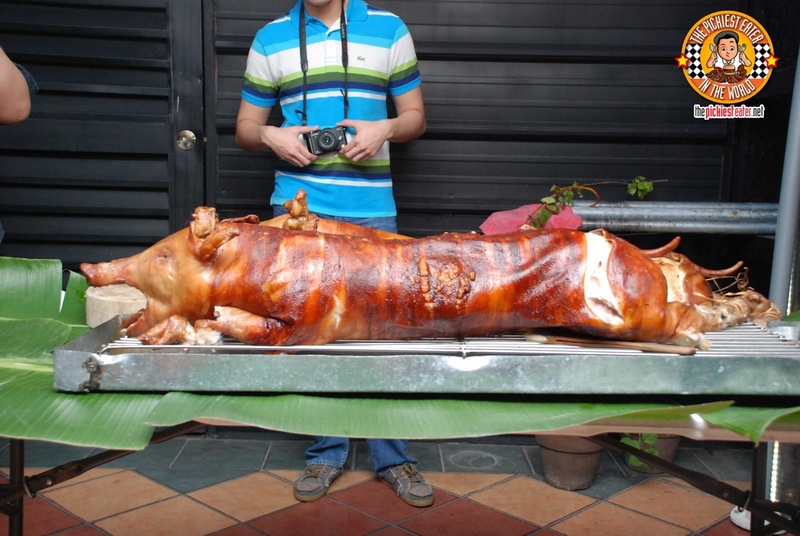 You know, I truthfully can't find anything wrong with this Lechon. I would say that the pig that they used was a little leaner than what I'm used to, but that's actually a good thing. 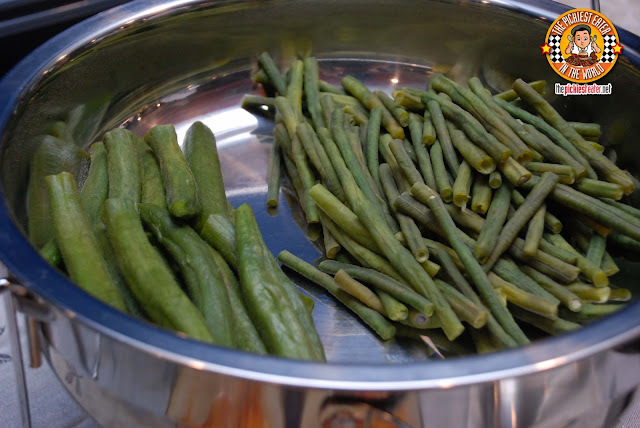 The presence of fat is still actually there, and it melts in your mouth with every bite. 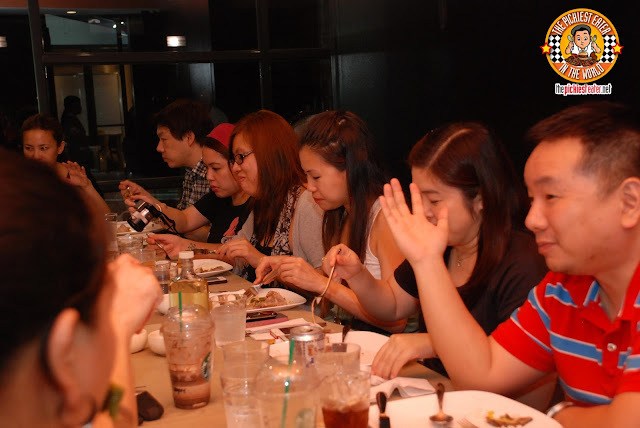 This is easily on par with the likes of the more high profile Zubuchon and CNT of Cebu. Everyone's favorite part of the Lechon.. THE SKIN!! 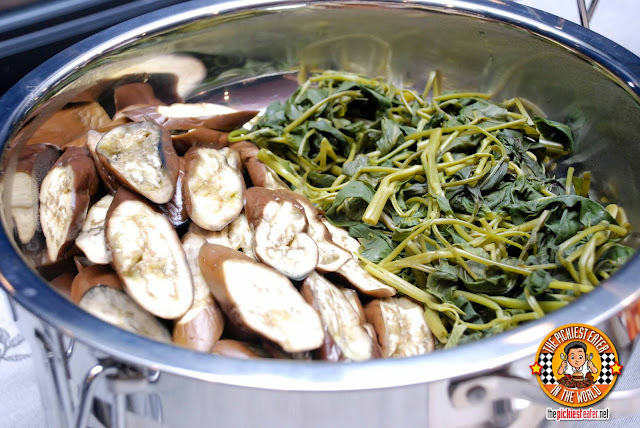 As a serving suggestion, our hosts at Diplahan Lechon offered a side of Egg plant and Kangkong..
And just like in Cebu, "Mang Tomas" sauce is shunned. 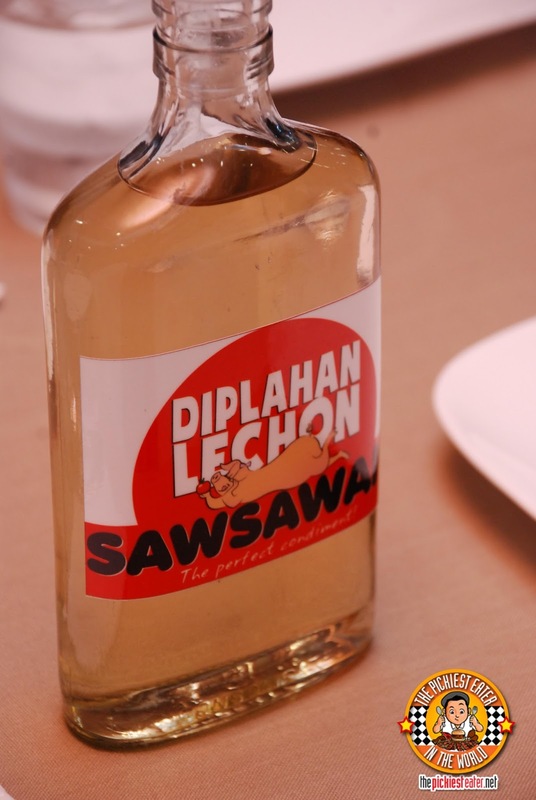 Instead, should you be looking for a dip to go with your lechon, Daplihan Lechon offers a Vinegar "Sawsawan" that many attest go with the meat perfectly. Every order of Lechon comes with one bottle. 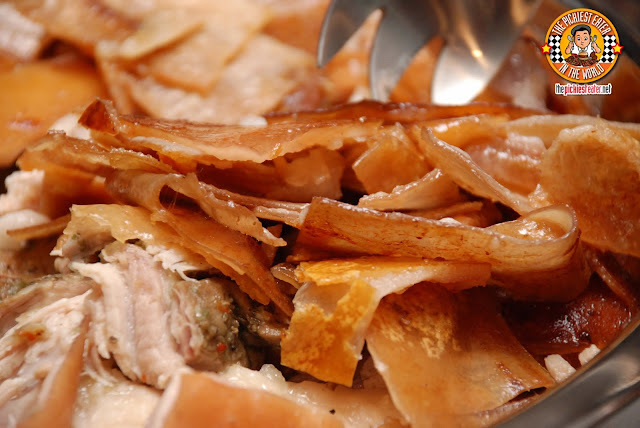 True to form, I like my lechon plain, so I could enjoy the natural flavors of the meat. 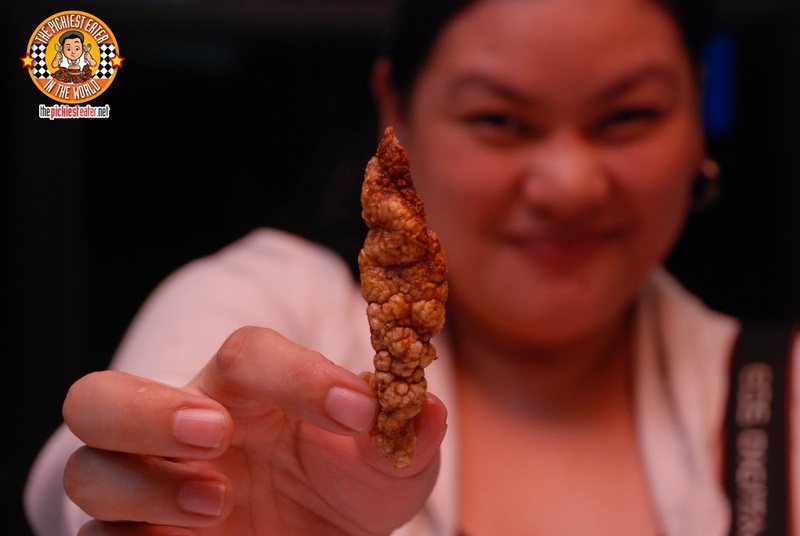 Just for fun, our hosts took the skin that was already "Kunat" and threw it in the deep fryer for us. This was the result. It was basically chicharon made on the spot for us. My dear friend from the blogger world, Yedylicious, who claims she is not a huge fan of crunchy things, could not get enough of this! 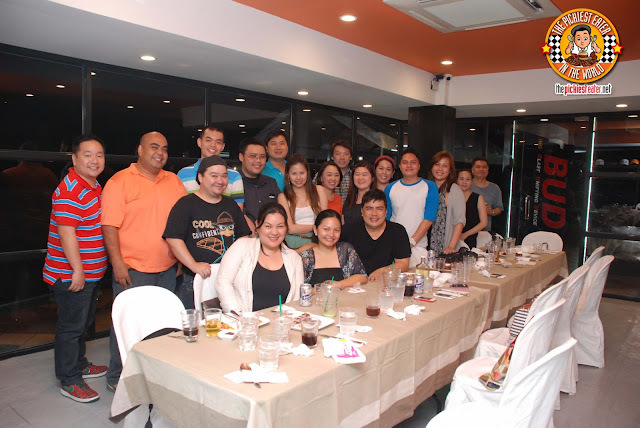 We all have our own preferred Lechon suppliers for our home or office or what not. Whoever your supplier is, I'm telling you right now.. 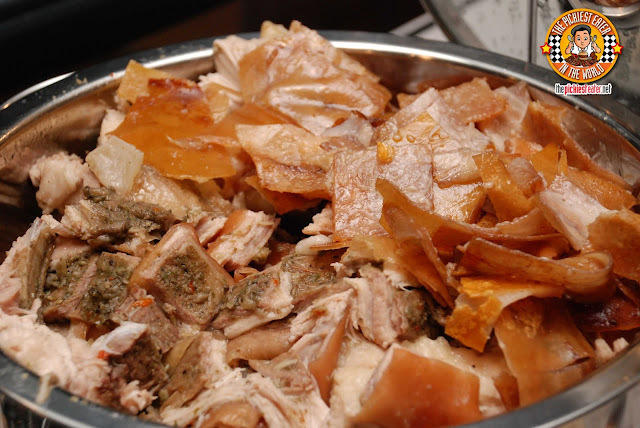 Dump 'em and give Diplahan Lechon a try. Weewee explained to me that, regardless of the cholesterol that the fat and skin might have, from his experience, the part of the Lechon that he worries about giving him "High Blood" the most are the BONES. Why? Because there was a time that he was looking forward to eating this lechon at a party, and when he got there, all that was left was the bones. When he found that out, his blood pressure shot straight up hehehe. Chilling with the Dude4Food and the WeeMan himself! 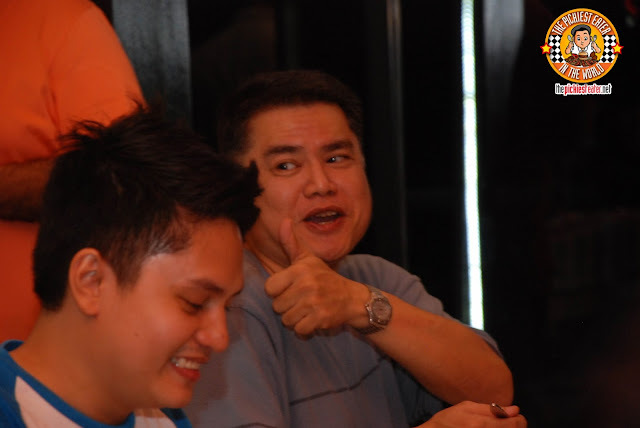 The San Miguels give Diplahan a thumbs up! Whenever there are Lechons being roasted.. You know the Kain-Tulog Gang will be ready at a moment's notice. Thank you Wee, Luisa and the entire team behind Diplahan Lechon for bringing the awesomeness of Zamboanga lechon to Manila! 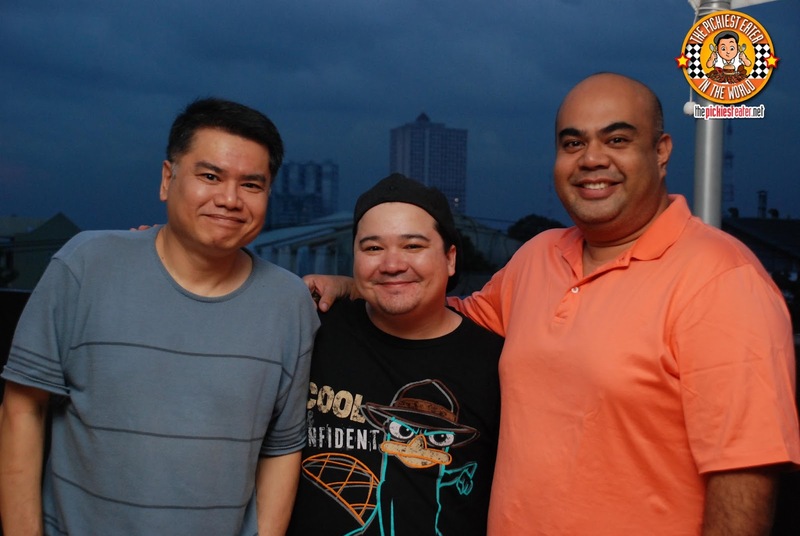 Try to catch them at Mezza Norte! I didn't know WeeWee's name was BENJAMIN!!! Hehe ya learn something new everyday!